Have you ever wondered why there are two ways to get by rail to Sevenoaks, Ashford, Canterbury and Dover, but only one to get to Southampton or Petersfield? The answer lies in bitter competition between the Victorian railway companies - and two in particular who competed for traffic in Kent. The early railway companies were profit-making businesses with no state support - something that was almost unique to the UK. In other European countries governments tended to decide what railway lines should be built, and while private capital may have financed them, the state often provided revenue guarantees. In the UK railways needed the permission of parliament, but it was given by private bills on a case by case basis. Whether a railway was approved or not depended not on any overall government plan, but on the whim of MPs (who would have included key landowners with interest in the outcome). Despite this, Victorian railway companies often managed to establish control over their own particular area of the country. On the edges of their territory they might compete with rivals, but within them they had a monopoly. A good example is the the London, Brighton & South Coast, which occupied a triangle south from London, spreading out to Portsmouth one way and Hastings in the other (see From London Bridge to the sea). Two large ceramic maps of the lines it ultimately built in this triangle are still to be found on the wall in Victoria station in the passageway down the side of Marks & Spencers. (The map nearer the concourse shows the longer distance lines: another near the station exit shows the suburban ones: see Lines we lost and A miraculous survivor for photos of the long distance map). Though some lines have since closed, this remains the territory of the Southern franchise to this day. The South Eastern Railway might have expected to similarly dominate the lines from London to Kent, especially after its rapid route building in the 1840s (see South East to Dover), but in 1859 it got a rude shock. In 1850 the North Kent Railway had been formed, initially to build a branch from Strood to Rochester, Chatham and Canterbury for which it got parliamentary permission in 1853. Leave to extend the line to Dover was added in 1855. The line opened from Strood to Faversham in 1858, and the East Kent applied for running rights over the SER's line from Strood to London Bridge via Lewisham. This the SER refused on the grounds that it would create a shorter route from Dover, Canterbury and the Medway Towns to London than via its own main line through Redhill. It was also peeved that its plans for a similar route had been refused by parliament in 1847, and thought - with some justification - that its new rival did not have the finance to build the lines it planned. But the East Kent was not to be put off so easily. 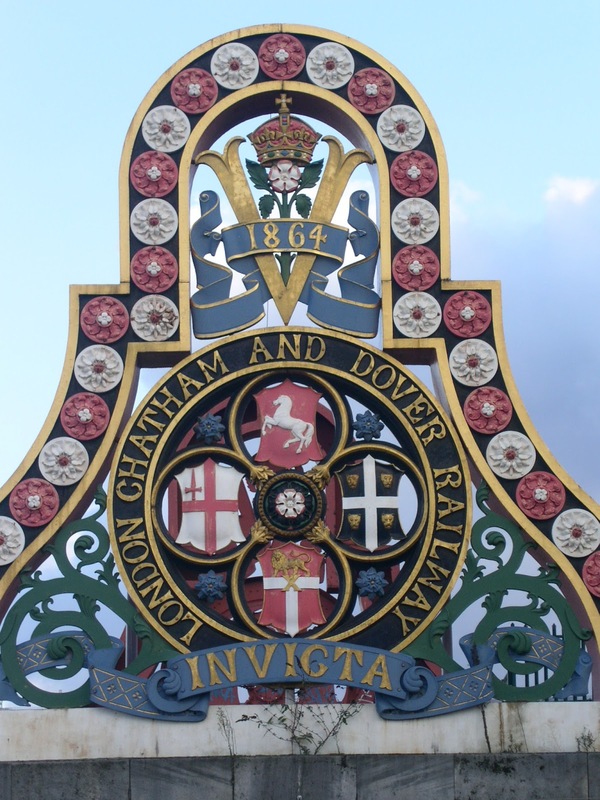 In 1859 it renamed itself the London, Chatham & Dover Railway and set about living up to its name. It extended its lines from Faversham to Canterbury (now Canterbury East) in 1860, and in the same year opened its own line from Rochester to St Mary Cray near Bromley. (This is the line that goes through Sole Street, though this station - incidentally, the highest point on the line - did not open till 1861). Through a series of alliances with small railways in London - mainly the West End of London & Crystal Palace Railway (see Terminus wars) - the LCDR then got access to the new Victoria station in 1861. In the same year, it extended its lines from Canterbury to Dover and from Faversham to Whitstable, with Herne Bay following in 1861 and Margate and Ramsgate in 1863. The South Eastern Railway now had a rival with a shorter route from London to many of its key markets - not to mention a terminus in the heart of the fashionable new suburbs of the West End. Needless to say 'The Chatham' (as it became known) lost no time in offering ferry services from Dover to Calais to compete with the cross-channel routes of the SER. It even opened a line in 1862 from Swanley to Sevenoaks, crossing the lovely viaduct you see as you walk into Eynsford. The SER’s answer was a hugely expensive new line through the North Downs from Orpington to Sevenoaks, and on through the Greensand Ridge to Tonbridge (the latter tunnel the longest in England at the time, at nearly two miles). This link opened in May 1868 and is now the main line. By this time the SER had had the satisfaction of seeing its over-ambitious rival go bankrupt as a result of the failure of finance house Overend Gurney in 1866 (the last bank collapse in the UK until the run on Northern Rock in 2007: Overend Gurney had invested too much in the railway mania of the early 1860s). The failure also affected the London, Brighton & South Coast Railway (see A miraculous survivor for the reasons) but both it and the Chatham recovered, and the stage was then set for 30 years of bitter competition between the Chatham and the SER that led to a heavy duplication of lines from which we still benefit. It was not only Canterbury, Sevenoaks and Dover that had two stations (the Chatham station in Sevenoaks is the one now called Bat & Ball, incidentally). The Chatham also extended their Sevenoaks line from Otford to Maidstone East in 1874, and to Ashford in 1884. This route made the SER branch line from Paddock Wood to Maidstone somewhat redundant and yet it survives to this day. So do two different ways to get to Canterbury, Dover, Ashford, Maidstone, Sevenoaks and even Bromley (Bromley North being the other one). The rivalry was fuelled by the SER’s chairman, Sir Edward Watkins. One of the giants of the Victorian railway, he had visions of linking the north of England with Paris via a Channel tunnel, and he had the means to do it, as he was also chairman of the Metropolitan Railway (the first underground line in London, opened in 1863 - see London's Victorian railways) and responsible for building what became the Great Central route from the Midlands to London Marylebone in the 1890s (see Thames and Chilterns). In 1881 he even started building his Channel tunnel, which advanced a mile or so out to sea, but in the end was blocked by politics and money problems. His opposite number at the London, Chatham & Dover was James Forbes, who was also in charge of the Metropolitan District Railway (now the District Line on the underground), a rival of the Metropolitan. Even though the two companies created the Circle Line (which opened in 1884), the Metropolitan ran the clockwise trains and the District the anti-clockwise ones, and there was little cooperation between them. They had separate ticket offices at each Circle Line station and were not above encouraging passengers to go the long way round so as to use their trains. Relations between the SER and the Chatham were just as petty and led to both companies - but especially the Chatham - becoming impoverished. Both were a byword for poor service and old carriages in the Victorian era (see The golden age of the railways). One example of their squabbling was on cross-channel routes. The SER had reached Dover first in 1844 and had developed Folkestone as a port from 1843 on onwards (see South East to Dover). Its Dover Town station was right at the head of Admiralty Pier, the new stone jetty from which cross-channel ferries went, and it had built a grand hotel there, the Lord Warden. But in 1853 it was disappointed not to get the contract to carry UK mail across the channel - it went to a local firm instead - and even more annoyed when the Chatham arrived in 1861 and built its Dover Harbour station a stone's throw from Dover Town. Worse was to come when the mail contract was re-tendered in 1863 and won by the LCDR. The Chatham also got permission to run its lines onto Admiralty Pier, as the SER had been able to do since 1861 (though the two companies had separate platforms). The SER's response to this new competition was to propose a truce and a sharing of all cross-channel and London to Dover receipts according to a fixed formula. The Chatham - by this time financially overstretched - agreed. Peace between the two companies never lasted long, however, and before the ink was dry on the agreement the SER was already plotting to circumvent it. In 1863 it opened a station to the west of Folkestone - Shorncliffe Camp, ostensibly aimed at serving an army barracks (still there and now the home of the Ghurkas) but in reality a way to get around the revenue-sharing deal. The SER would decant passengers at Shorncliffe, take them by road to Folkestone harbour, and claim that they were outside the agreement. The Chatham sued them on this point and eventually won. Folkestone nevertheless remained the most important cross-channel port for the SER, and the LCDR was keen to get access to it, and so in the 1880s it proposed to parliament a line from Canterbury to Folkestone via the Alkham Valley. The SER countered with its own scheme, the Elham Valley line, which won the day and opened in 1887, joining the main line at Shorncliffe. 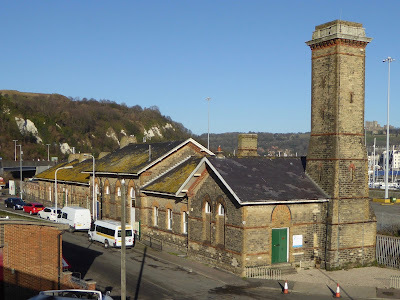 To win over public opinion in Folkestone to their proposal the SER offered to build a new station between Shorncliffe and Folkestone Junction. This opened in 1884 as Cheriton Arch, changing its name to Radnor Park in 1886. It became the most popular station for the town and in 1895 was named Folkestone Central. Though the Elham Valley line closed in 1947, Shorncliffe also survives, renamed Folkestone West in 1962. Later in the century both companies also tried to develop new cross-channel ports on the North Kent coast to get around the revenue-sharing agreement - Queenborough for the Chatham and Port Victoria for the SER - but both failed to attract much business. They did cooperate on one line, however – the link between Dover and Deal, which opened in 1881. The line joining the two companies systems at Dover - the Hawkesbury Street Curve - dates from this era and is now the main line from Folkestone into Dover. Trains come in along the top of the beach, then lurch inland on the curve, passing the remains of Dover Harbour station, which closed in 1927. You then go through a tunnel into Dover Priory, originally a Chatham station. Eventually the companies came to realise that their fierce competition was doing neither of them any good. A bill to unite not just these two companies but also the London & South Western Railway and the London, Brighton and South Coast Railway had been passed by parliament as early as 1868, but the deal fell apart because of a disagreement over rates. But in 1899 the SER and Chatham did agree to a joint management committee - the South Eastern and Chatham Companies’ Managing Committee, or the South Eastern & Chatham for short. This was not quite a merger – the two companies remained financially independent of each other – but was almost the same thing. This alliance has consequences to this day. The two companies agreed to recognise each others tickets and routes, and it is for this reason that a return ticket to Yalding is valid for return from Borough Green. In Bickley, just east of Bromley, they built a connection between their two networks and this is still regularly used during engineering works, for example to run Charing Cross services out of Victoria. Otherwise, the main legacy of the rivalry is the wonderful multiplicity of routes across Kent – all now in the Southeastern franchise. Thankfully the duplication of stations has for the most part gone. In Maidstone, Canterbury and Bromley there are still two stations, but in many other places - Sevenoaks, Ashford, Rochester, Chatham, Gravesend, Whitstable, Dover, Margate and Ramsgate – they were merged. At Dover docks the two companies cooperated to build Dover Marine station on Admiralty Pier which opened for military traffic in 1915 and for civilians in 1918. It was the station for boat trains until the Channel Tunnel made it redundant in 1994, but still survives, no longer connected to the rail network, as a cruise ship terminal. Incidentally, the Chatham and the South Eastern were not the only two companies to enjoy bad relations with each other. The South Eastern and the London, Brighton & South Coast also squabbled incessantly at the points where they came into contact. 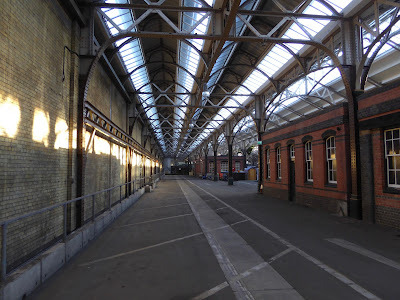 One was in Hastings, which the LBSCR had been the first to reach in 1846, but only via a station to the west of the town of St Leonards and so some way from Hastings itself. The company had wanted to carry on to Ashford, but in fact it was the South Eastern that eventually ended up building this line, starting from Bo Beep Junction (named after a pub popular with shepherds and still so called) just south of West St Leonards station and carrying on through the current St Leonards Warrior Square and Hastings stations by 1852. The LBSCR had running rights along this line to Hastings, but until the SER opened its Sevenoaks shortcut in 1868 the LBSCR had the shorter route to London (76.5 miles via Lewes, as opposed to the SER's 93 miles via Tonbridge and Redhill). So the SER resorted to childish tactics such as blocking LBSCR trains in or even removing tracks overnight so they could not use the line. It was not until 1870 that they let LBSCR trains stop at St Leonards Warrior Square. To this day the former LBSCR line passes within a few dozen metres of West St Leonards without having any access to that station. Another point of friction between the SER and LBSCR was East Croydon, where the LBSCR for a time in the 1860s tried to create its own separate station, and the two companies also squabbled over who should operate a line from Purley just south of Croydon to Caterham, which had been opened by an independent company in 1856 and gone bust three years later. The SER eventually won the battle but had its trains obstructed by the LBSCR at every opportunity. Perhaps the most notorious flashpoint was at Redhill, however, where the SER’s original line to Dover started (see From London Bridge to the Sea and South East to Dover). The SER and the London, Brighton & South Coast shared the line from East Croydon to Redhill, but ownership was split, with the LBSCR owning the part from Croydon to Mertsham and the SER the section from Mertsham to Redhill. There was much argument about whose trains had priority, and finally in 1899 the LBSCR built a line bypassing this whole section of track, which is known as the Quarry Line. To this day this allows fast trains to Brighton to bypass Coulsdon South, Merstham and Redhill, and is very useful during engineering works.